The cases and overall quantum of Non Performing Assets in Banking Sector have reached alarming levels. RBI has specially brought out a list of 150 extra large borrowers having weak financial health. The size of borrowings by certain borrowers has grown geometrically impacting debt-equity ratio, large and risky financial leverage and risk to financial market system. In view of large NPA, the Banking system has become averse to further lending, thereby negatively impacting Make in India, New projects, expansion, working capital and growth and growth momentum of economy. The Assessment of credit need, strength and sources of promoters, viability of the project, estimated time for completion, risk of contingency, regulatory and policy risk is inefficient and ineffective. The systems are not commensurate to the need and there is significant lack of appropriate skills within the banking sector. The professional integrity, ethics, professional business friendly approach need commitment and strengthening. Major capital expenditure commitment by borrower and the group companies. Investment in associates, subsidiaries etc. The drawing power allowed to borrowers on the basis of inventory and debtors is not supported by credible and verified information. The Issues highlighted in the borrower's Audit Report and Notes to Accounts are ignored. Diversion of funds or improper end use is not monitored by detailed scrutiny of Annual/Quarterly financial statements. The break up schedules and actual facts behind the published figures are ignored. Related party transactions, overdue debtors, non moving stocks, advances not relating to business, unapproved investments are all ignored. Increase in Current liabilities, Secured loans of borrower from third parties, Borrowings from other banks, NBFCs, Commercial paper, Debentures and Deposits are not taken into consideration while monitoring credit. The bank's Board of Directors, Top management and Middle management have a big dearth of knowledge and skill to analyse borrower's financials, notes and their qualification in their Audit Reports. There is hardly any system to monitor financial statements and actual physical operations of even very large borrowers on an ongoing basis or even during disbursements. Early warning signals are not captured for necessary action. Even branch audits appointments has been restricted to 20% large branches and appointments are made very late towards end of March, while expecting and insisting reports in 7 to 10 days, leaving hardly any time for detailed review. The appointment is being made by management and not by independent persons. Inadequate action is taken on audit reports by bank auditors including account wise comments in long form Audit Reports. Even there is no focus on credit monitoring through a specialized Audit keeping in view that internal credit monitoring is very weak. Strengthening of the Board of directors, top management and key positions by capable and rightly qualified persons. Employment of qualified Chartered Accountants in larger numbers will significantly help. The time spent on judiciary process needs to be curtailed drastically. 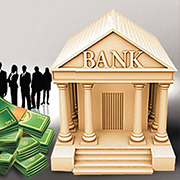 A regular Bank Information System is to be put in place so that periodical updates of borrower, Group companies, subsidiaries, associates, related party transactions and specific areas and nature of transactions is duly reported to the bank as certified by an Independent firm of Chartered Accountants. The appointment of auditors needs to be undertaken independent of Bank's management. RBI has been one of the most effective regulator and banking supervision and guidance has to be revamped significantly by RBI. Even RBI annual inspection report should be an open public document at least for all levels of bank management and all Auditors and consultants. The role of politicians, ministry of finance and administrators in the working of public sector banks. Industry specific factors shall be considered before declaration of an account as NPA. Every industry has its distinctive features. Let the NPA norms be formulated and modified accordingly.